The contentious Line 3 oil pipeline took one more incremental step toward construction Monday. Without any debate or questions, the Minnesota Public Utilities Commission unanimously reaffirmed its earlier support for the pipeline and denied requests from environmental groups, Indian tribes and the state Department of Commerce to reconsider its June decision to approve the project. The commission also finalized plans for Enbridge to comply with several different conditions they had imposed on the company as part of that initial approval, including guidelines for over $1 billion worth of insurance coverage in the event of a major spill, and a plan to remove the abandoned pipeline at the request of landowners. The votes were expected — it's rare for commissioners to reverse their decisions. Still, it's another step forward for Canada-based Enbridge in its years-long bid to replace its aging and deteriorating pipeline that carries hundreds of thousands of barrels of oil from Canada every day across the state. Commissioner Dan Lipschultz said the PUC's unanimous approval of the pipeline earlier this summer was the result of "probably the most extensive and thoroughly vetted record" he's seen at the PUC, and said he hasn't seen any new evidence or arguments that would compel them to reverse what he acknowledged "wasn't an easy decision," but one he said "was the right decision based on the record and applicable law." 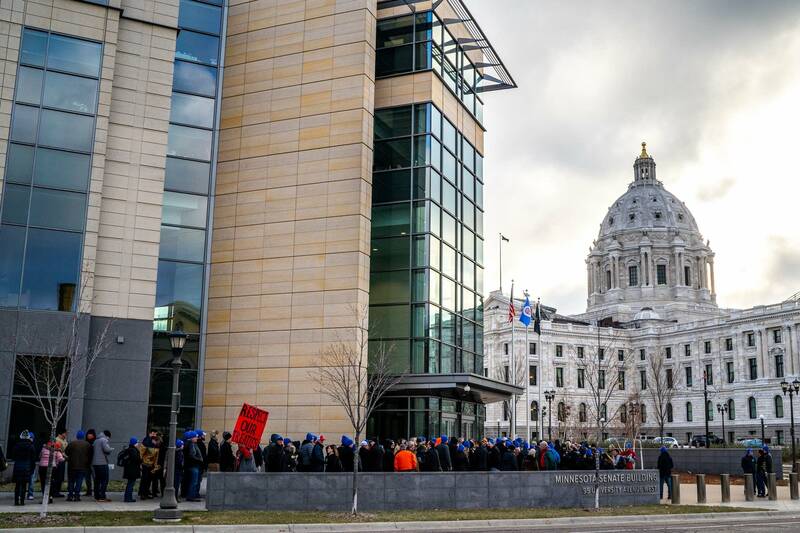 Immediately after the PUC voted 5-0 not to reconsider its earlier decision, pipeline opponents in the audience at the Minnesota Senate building stood to shout their opposition. 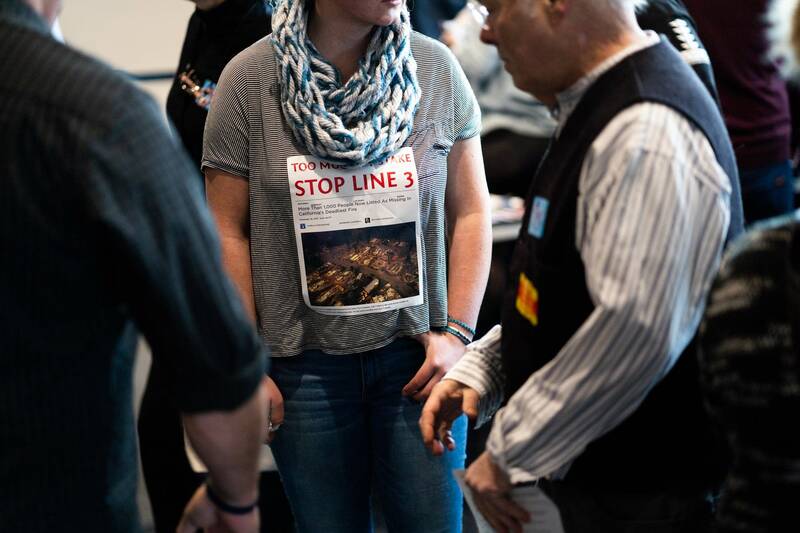 "Line 3 is an immediate carbon disaster. We will stop Line 3," they chanted, while chair Nancy Lange tried to gavel the meeting to order. After about a minute, they quietly filed out. 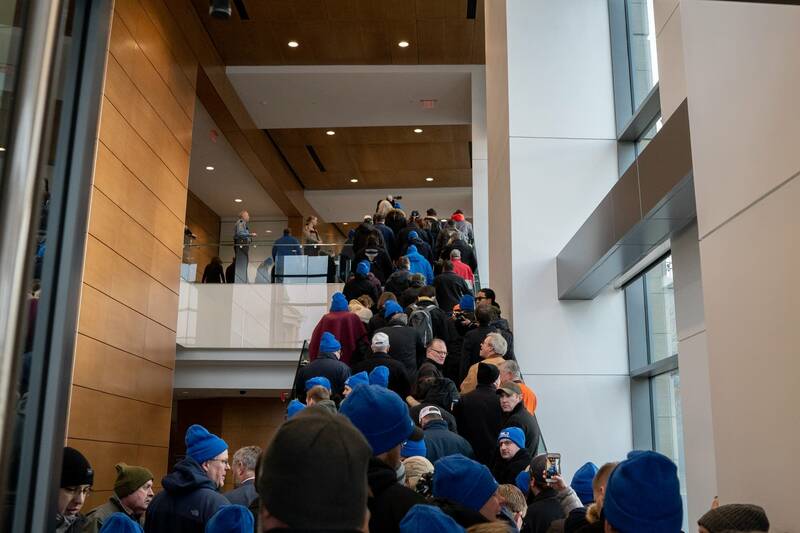 Later a group of about 50 activists walked to the office of Governor-elect Tim Walz, where they presented an aide with a copy of a recent report on the impacts of climate change, and appealed for Walz to intervene to stop the project or try to mitigate its impacts. "It's going to cause actual harm to real people, not hypothetical harm, but harm, hurt, to people in Minnesota, that greatly outweighs the benefit of the project, if it's allowed to move forward with construction," said Andy Pearson with MN350, adding that action is needed soon. After the PUC meeting concluded, supporters of Line 3 also visited Walz's transition office, where they presented the incoming governor with hundreds of postcards from backers of the pipeline. "The Line 3 replacement project offers the state further economic security, as well as protecting our natural environment that is so important to Minnesotans," said Nancy Norr, chair of the pro-pipeline group Jobs for Minnesotans. The new Line 3 will replace an existing, deteriorating pipeline that carries Canadian oil across northern Minnesota to refineries in the Midwest and beyond. It crosses through land where tribal members have rights to hunt and fish and harvest wild rice. Originally, Line 3 could carry 760,000 barrels of oil a day. But as the line has aged, it can now only handle about half that amount. A new Line 3 will boost capacity back to its original level. Opponents of the line have argued that Minnesota doesn't need the additional oil, that it puts at risk important lakes and rivers, and that it will worsen the effects of climate change. But when regulators granted Enbridge a certificate of need to build the new line in June, they said it was a better option than allowing the old, degrading line to continue operating. Regulators also approved a plan for Enbridge to obtain insurance to pay for what the company said was a $1.4 billion dollar worst-case oil pipeline spill &mdahs; a figure that opponents said wasn't nearly high enough. They argued it was based on best-case assumptions about how fast the company could respond to an accident and didn't consider the possibility of multiple accidents on different pipelines that the company operates. Enbridge has repeatedly argued it has the financial capability to respond to major spills, both with insurance and the company's own funds. The PUC meeting was "an important step," said Paul Eberth, who directs the Calgary-based company's Line 3 project from its offices in Duluth. Eberth said the PUC next needs to finalize an order for the proposed route of the pipeline across northern Minnesota. Then the company needs to obtain more than 20 local, state and federal permits, which Eberth said he expects by early 2019. He added Enbridge plans to begin construction on the $2.6 billion project in the first quarter of next year and put the new pipeline in service by the end of 2019. But several groups have already sued to try to overturn the state's approval of the environmental study of the proposed project, and several more vow to appeal this decision to finalize the project's certificate of need. "We're going to stand for mother earth," said Winona Laduke with Honor the Earth, just one of several organizations vowing to challenge the decision at the Minnesota Court of Appeals. Those appeals are expected by the end of the year. Several groups have also started activist camps in northern Minnesota, and have vowed to conduct mass protests when Enbridge begins construction. "I'm hoping we don't get to that," said Laduke. Politicians also weighed in on the PUC decision. "The PUC made the right decision today, standing up to the protesters who sought to shut down the meeting and derail the regulatory process we have in place," said Rep. Pat Garofalo, R-Farmington, who chairs the House Jobs & Energy Committee. Meanwhile, Governor Mark Dayton said in a statement he's disappointed that the PUC "chose to evade the very legitimate concerns" the Department of Commerce has raised. "We will be reviewing our options now that the proceedings have concluded," he said. MPR News reporter Brian Bakst contributed to this report.